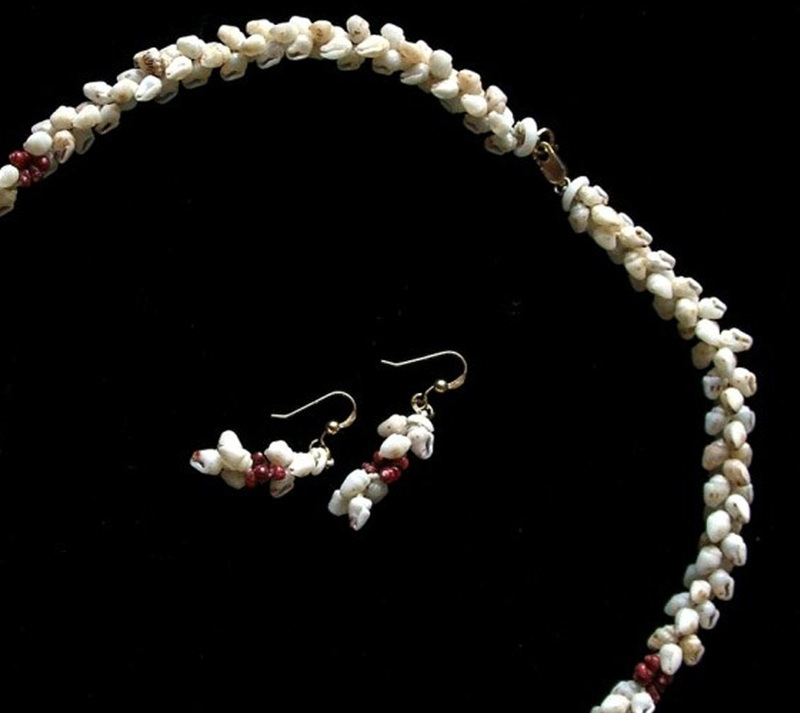 Ni‘ihau jewelry in the roselani style. Friday, November 9 10:00 A.M. to 4:00 P.M.
Saturday, November 10 10:00 A.M. to 4:00 P.M.
On either day you may learn how to make a 22-inch necklace/lei ($370 for Museum members, $380 nonmembers) or pair of earrings ($75 members, $85 nonmembers) in the roselani style, using your choice of momi ke‘oke‘o (white) or momi lenalena (yellow) shells, and your choice of pink or red kahelelani shells. Choose your colors when making your reservation! You may, of course, create more than one piece, as long as you sign up for specific pieces in advance. Space is limited to 24 persons per day; only people who have registered can be permitted in the classroom. Reservations must be made, pieces and colors specified, and the workshop fee(s) paid by Saturday, November 6, to ensure your place and the availability of shells. Celebrate Mele Kalikimaka with these treasures of Ni‘ihau! For more information, and to make your reservations, please call 935-5021 ext. 101 or stop by the Museum’s Admissions desk.